BBC1’s Essential Mix has become one of dance music’s most revered radio shows over the course of its 23-year existence. Aside from the occasional mix big names in the industry, the show generally caters toward cutting edge music of the underground through featuring iconic and upcoming figures in house and techno. However, one genre is often overlooked by the Essential Mix, and that genre is trance. 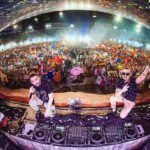 Despite having not been featured on any 2015 Essential Mixes, the genre experienced a bit of a resurgence throughout 2015, culminating in the first-ever Dreamstate in the United States with fans loudly demanding its return to the public eye. It turns out BBC staff were listening to their united cries, announcing that trance would return to Essential Mix in February. It has now been revealed that none other than Aly & Fila will take over the decks for their first-ever appearance on the show, making it the first trance mix since February 2014. Despite Aly having remained widely absent from the duo due to an ear injury a few years ago, Fadi has carried their name forward with their widely successful Future Sound Of Egypt (FSOE) that showcases the genre’s uplifting, faster sounds. Their following has increased largely in numbers as of late as listeners swiftly find themselves enamored with their brand of uplifting, emotive trance. The two-hour slot will take place on February 13th, right in time for Valentine’s Day.